Green Mint Chocolate Chip Cookies . 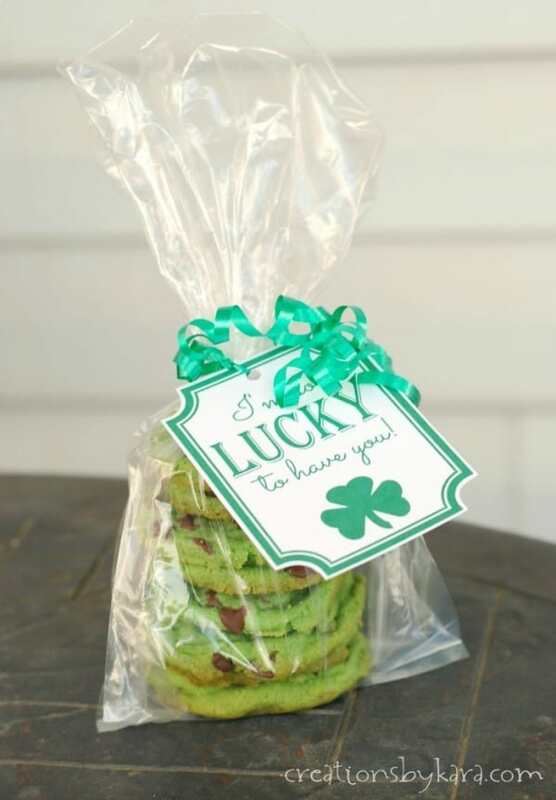 . . these chewy mint chocolate chip cookies are colored green for St. Patrick’s Day. A fun and tasty treat! St. Patrick’s Day is just around the corner. I don’t do much in the way of decorating for St. Patrick’s Day, because sometimes Easter is so soon after that I don’t want to bother with getting everything out just to put it away. Any of you like that? While I don’t have many decorations, I do love to make fun food for St. Patrick’s Day! And since I am a huge fan of mint chocolate, and mint is usually green, I’m all about finding ways to add it to our St. Patty’s menu. These Mint Chocolate Chip Cookies taste just as good without the green food coloring, but it sure makes them fun! I adapted this recipe from a wonderful cookie recipe I got from a friend years ago. It called for Andes mint bits. They are wonderful as well! But when I saw these semi sweet mint chips at Walmart, they practically jumped into my cart! You might be wondering why there isn’t any peppermint extract in the dough. I thought about adding it, but I didn’t, and I think they are plenty minty just the way they are! Don’t they look cute all packaged up with a pretty gift tag? And who wouldn’t love a batch of fresh baked chocolate chip cookies? I know I sure wouldn’t mind! Click here for the free printable gift tag. These are my go to products every time I make cookies! Silicone Pan Liners – they make clean-up a breeze, and nothing sticks to them! Hand mixer – I like using a hand mixer to cream my wet ingredients, but I like to stir in the dry ingredients. I think it makes for a more tender cookie. Cookie scoop – it’s much easier to get uniform sized cookies with a cookie scoop. I have a couple of them. 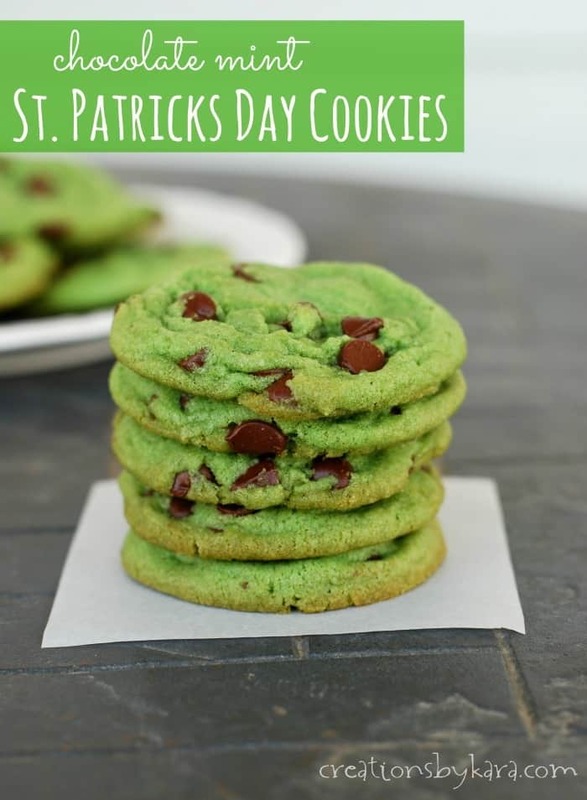 Chewy mint chocolate chip cookies colored green for St. Patrick’s Day. A fun and tasty treat! Cream butter and sugars in a large bowl till creamy. Beat in eggs, vanilla, and green food coloring. Add flour, salt, and baking soda. Stir till blended, then stir in the mint chocolate chips. Drop by tablespoonfuls onto lightly greased or silpat lined cookie sheets. The mint chocolate chips are pricey online, so if you can't find them in stores, you can substitute Andes mint baking bits. You can see all my St. Patrick’s Day recipes HERE.